After finishing the cross country season on a high note, the men and women teams are training hard in preparation for the indoor track season on Dec 6 in the armory. Both teams competed well in the CUNYAC Cross Country Championship. The men’s placed 8th while the women’s placed 6th. On the women’s side, it was led by Freshmen Alana Johnson who placed 10th in the 6k event under 28 mins and 20 seconds. On the men’s side, Freshmen Roy-den Wallace placed 36th and Senior Jesus Medina placed 38th. Medina described his performance on the championship and what they are doing this month. Medina also wants to make this his best year since it is the last season for him. He is focusing on the 400 event and wants to improve on his personal best. He also wants to push everyone in their respective events and go for the championship. While Medina is focusing on his individual goals, another player is focusing on his training as well. Freshmen Eric Normil-Mendez is preparing the season by improving his endurance. “I’m working on my endurance by doing 40 min long runs and my speed by doing lap repeats as well as our usual sprint dynamic workout drills, weight training and of course working on my diet,” said Mendez. Other men track players such as Senior Derrick Clinton and Junior Ismail Oluwo will also be training hard in Nov for the season. Head Coach Mark Benjamin this month is using different training techniques to push them and improving on certain events. Benjamin is emphasizing his players to improve on their personal best as well. He wants to improve on his distance, hurdles and high jump events. He also expects Medina to stay healthy throughout the season. The training in cross country is different compare to indoor track. He uses not only the track in the school, but the basement as well. 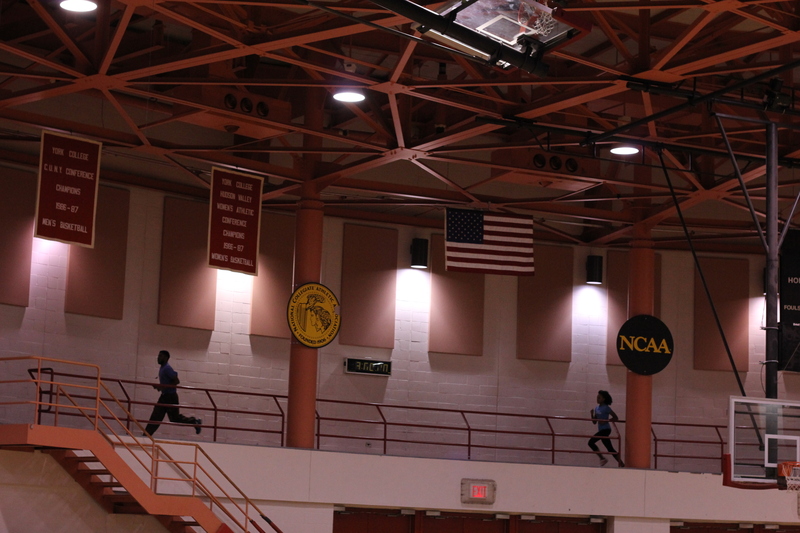 Running up and down the stairs help out the players on leg strength and stamina.While the men’s team is practicing hard, the women’s team is also in preparation for their respective events. Johnson did well in the cross country championship and her teammates appreciate her mindset and altitude on the competition. Benjamin doesn’t know what Johnson will do in the indoor track season, but Medina describes her as a strong competitor. Women track players such as Senior Shanice Brown and Junior Diana Cuevas will also work hard for the individual goals. Staying healthy in sports can be very tricky and can cause a team the chance to go far in the playoffs. Benjamin preaches on the team with nutrition, sleeping habits and taking care of your body. He hopes by december everyone will be in top shape and ready to go. The teams will start the season on Dec 6 in the West Point Open.